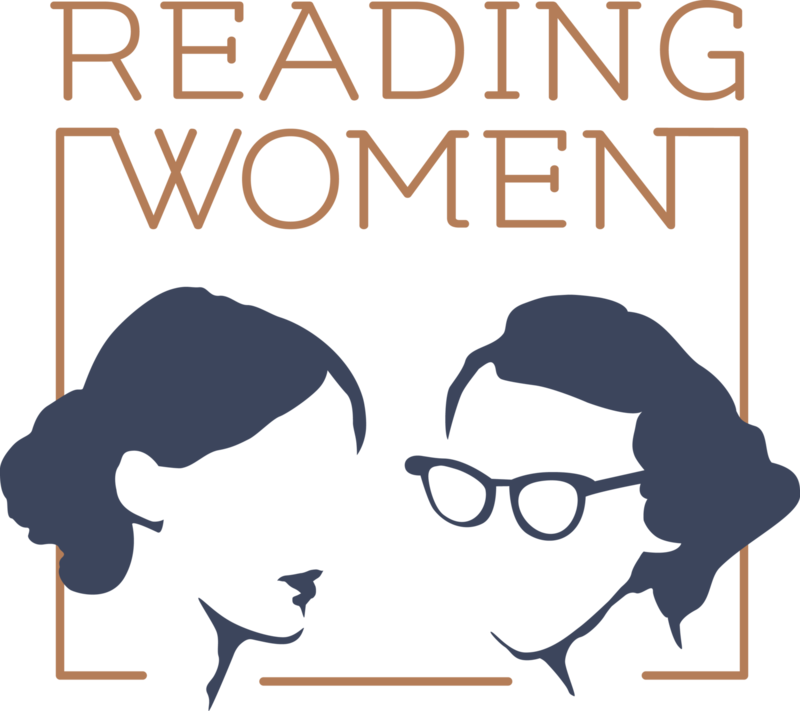 Maker of things old: reuser of things past - stitching and crafting, books, gardening, life and travel. 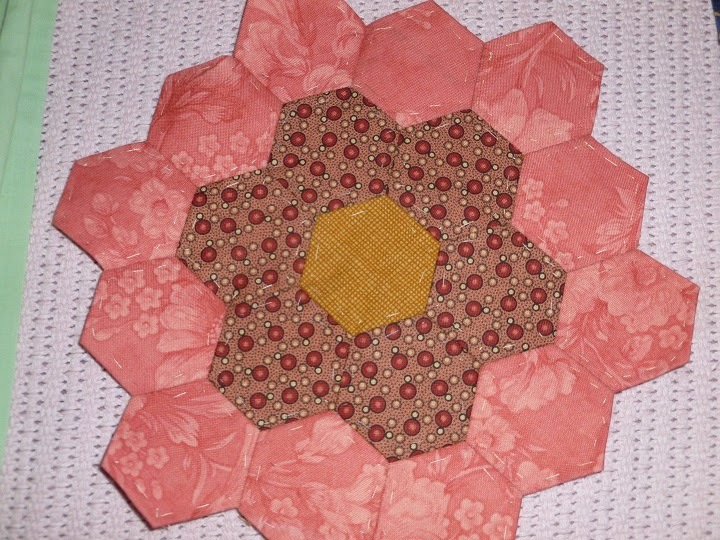 I started hand piecing a hexagon quilt about 10 years ago... I'm still doing it! 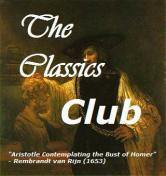 Its one of those long-term projects that gets picked up and put down regularly. 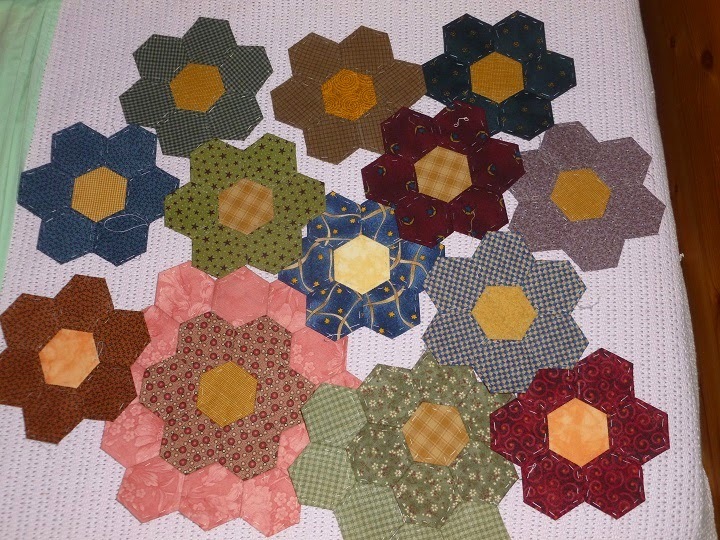 I was inspired by some Grandmother's Flower garden quilts I had seen online so the blocks are made up of a yellow center, a circle of 6 darker fabrics and another circle of 12 lighter fabrics. These blocks are then to be separated by a row of white hexagons. All of these have been hand tacked and hand pieced, the size of the hexagon is about 1 3/4" - this is likely to be the only quilt I make that is hand pieced. I am not sure how many flowers I have made so far... below are the finished flower blocks I have done - 1 with the white surround. 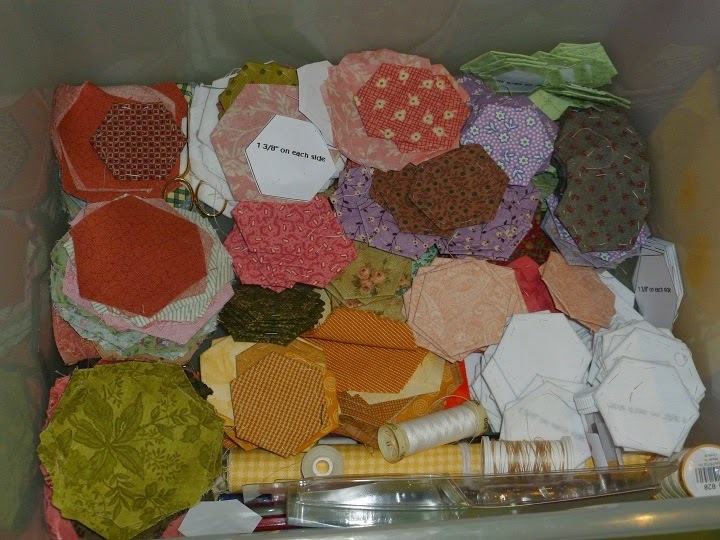 I have many more in various stages of construction and lots of fabric cut and hexagons tacked. No fabric has been repeated, so each flower is different. 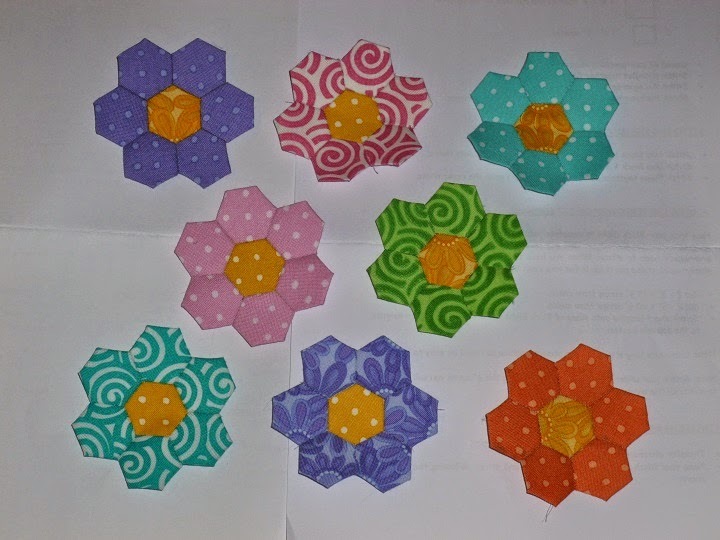 I have also been working on some smaller hexagons over the weekend. 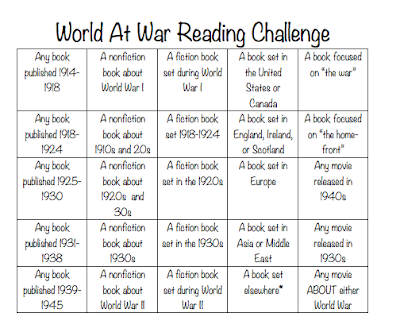 These are for a small round-robin I have been involved it. These measure about 1/2-3/4" - so quite small. I now have to sew these onto the next boarder and do some embroidery... I think they are looking great - love the colours of these small flowers. 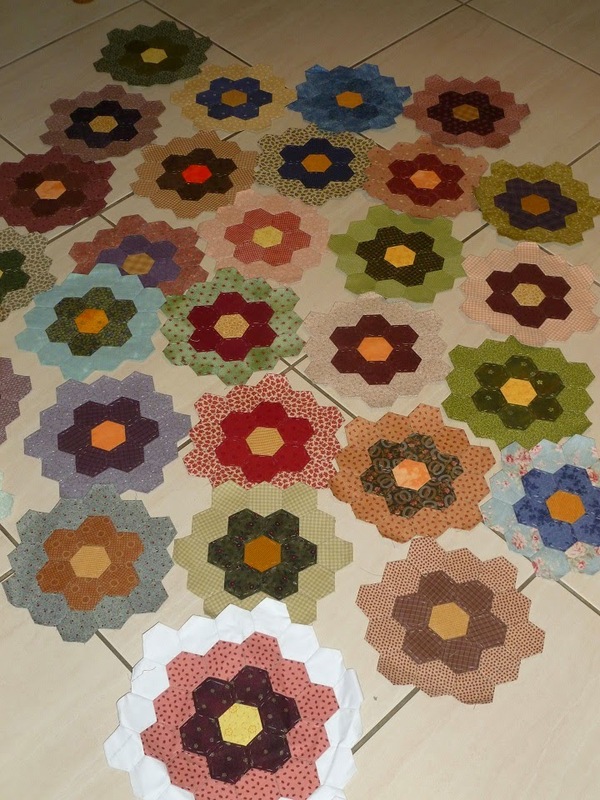 I made a hexie quilt for my daughter many years ago - it took me 7 years to complete it. I love hexies and hand piecing but have them all on hold while I try to reduce the UFO pile! I think this will be the only hand pieced quilt I make.... it is taking a long long time.... but I am enjoying the process and love finding fabrics to go with it. Hi Anthea, You'll have to make a trip to Cairns to visit your brother... just dont come until the dry season... you'll melt like a snowman at the moment. Very hot and humid! I hope to do some more EPP this year as well.. have seen some lovely things on blogs lately.. very inspirational. Hi Susan, yes I love the look as well and want to make some smaller things with hexagons this year - pincushions and needlecases for my market stall.